London-based Vienna Ditto are a very good example of a band that everyone needs to hear at least once. With the duo rearing up to release their new single Hammer And A Nail, which continues in the trend of doing something out-of-the-ordinary, they can do just that. Vienna Ditto consists of Hatty Taylor and Nigel Firth, a pair who first met when the latter started teaching guitar when she was 11 years old. After a couple of years they lost touch, but in one of those strange twists of fate they literally bumped into each other in the street in 2009. Since then it has been musical triumphs for Vienna Ditto. Their intriguing blend of smoky blues, psychedelic rock and electronica has earned them airtime from the likes of BBC Radio One, BBC6 Music and XFM, and received several glowing reviews in Q Magazine, Artrocker and The Fly. Hammer And A Nail seduces your ears and thoughts with its celestial electronic wash. The pensive guitar strokes alongside a pulsating beat both compliment the smokey, seductive, almostEdith Piaf-like tones of Hatty’s voice. Creating trips of sultry bewitchments, smoldering arcane blues that evoke unique adventures in imagination every time. 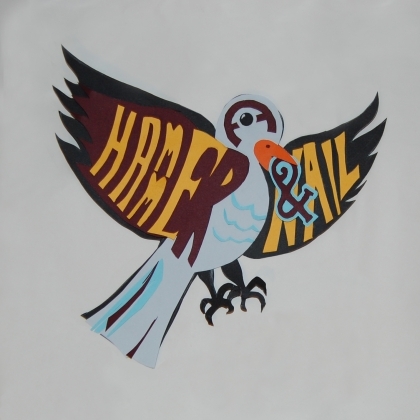 Hammer And A Nail is reminiscent of Portishead and The Knife, both making music whilst watching Pulp Fiction and spinning on a rather trippy carousel. Hatty’s dreamy vocals, alongside Nigel Firth’s almost Split-Enz-like production, make this band something very adventurous and exciting. It’s not an easy task for a band to create a truly unique sound, but Vienna Ditto seem to just do it naturally, and with no effort at all. Their new single shows off all their skills to the highest level, and will be available for sale and download everywhere from 23rd February 2015.